After 20 Months Google’s Campus London Hub Has 22,000 Members, So Where Next? Opened in April 2012, Campus London, Google’s East London ‘startup hub,’ was something of a new departure for Google. It was taking out a ten year lease on a building which would be populated by co-working spaces, accelerator programmes, hackers and startups that Google had nothing to do with and Google would not even have a financial stake it in. In part it might be construed to have been a political move. The search giant was under pressure from the UK government to show it was prepared to back the government’s efforts to drive technology entrepreneurialism. But funding one building – no where near as big as it’s usually vast staff offices – was effectively ‘spare change’ for Google. And 20 months on it’s released data assessing whether it considers the Campus project has been a ‘success’ or not. Its second members survey released today (a survey of 2,000 members) shows that it appears to be doing a pretty good job of being a centre for tech people and entrepreneurs to gather and spin things up. Now, before I get into this I’m bound to mention a disclosure, which is that I’m a cofounder of TechHub, a co-working space which has space in the Campus building (aside from two other office around East London). That said, given the sheer amount of people milling around, it’s pretty plain to anyone who visits or works there that Campus has done a lot to act as a locus for startups in London. Campus says it now has more than 22,000 members (hailing from more than 60 countries) and has hosted more than 1,100 events and 1,000 mentoring sessions in the past 12 months, for more than 70,000 visitors. To be a member has proved pretty easy – it’s free to apply and join and you simply have to be ‘in tech’. You can apply online, or just turn up at their front door and ask. Google has also very low rates – all the way down to free – for its event hosting costs as a venue, if you are a tech organisation. It’s proved to be a shot in the arm for many struggling hacker meetups and the like. With all that said, by pre-populating Campus with co-working spaces and accelerators (members include TechHub, Central Working, Seedcamp, and most recently Tech Stars London) it kind’ve ended up with a ready-made ecosystem. Campus then doubled-down on this with it’s own events, and with other events and organisations from the wider ecosystem. The model has clearly worked. • Job Creation: Campus estimates that at least 576 jobs have been created within the Campus community in the past 18 months. Now, that doesn’t really sound quite high enough to be honest, and I really doubt that includes the companies that may have spun out a few months ago, got their own offices, funding and then staffed up. It also seems paltry, given the 22,000 member base and suggests that it’s quite hard to track what is really going on out there. However, Campus says the number of jobs is drawn from the sample of members that took the survey (2,000) which clearly isn’t even 10 per cent of the members. • Fundraising: This is where there appears to be more ‘success’. 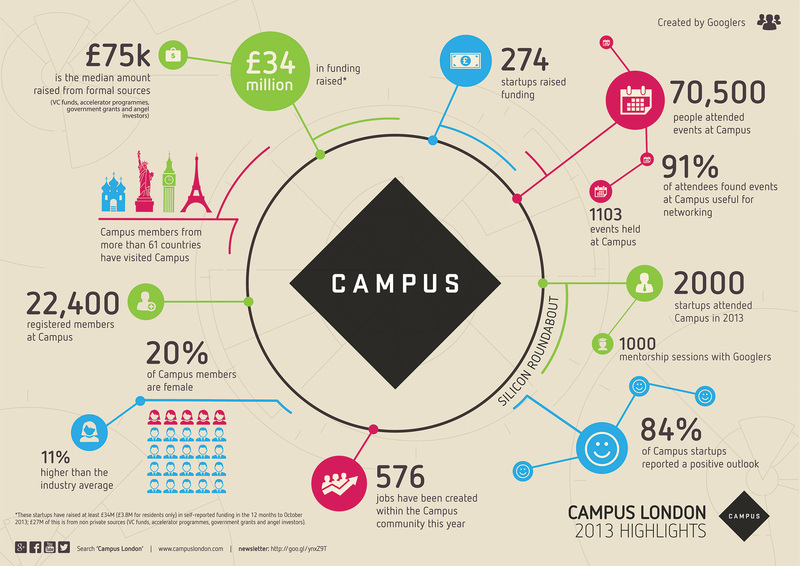 Campus ‘members’ – anyone from one-person startups to full-blown, staffed companies – have raised at least £34m in the 12 months to October 2013. The median amount raised from formal sources (VC funds, accelerator programmes, government grants and angel investors) is approximately £75,000. Remember, most of these are super early stage companies. Given they include the members of the accelerators Seedcamp and, latterly, Tech Stars London, this would probably account for the bulk of the fundings. Is Campus taking credit for the work of these organisations? Perhaps ever so slightly, but then, by creating this physical, central location where investors can come for deal-flow, Campus would clearly have contributed to the overall picture. • Gender Equality: Campus says it is is helping to address the gender imbalance in the tech startup industry. The presence of women at Campus continues to grow, now at 22% of residents and 20% of the overall member base – compared to the 9% tech industry average. Campus is continuing programmes like ‘Campus for Mums‘ and ‘Women at Campus’ to help move the needle. • Growth: Anyone wandering in (and that includes me, as I am there plenty) would see Campus as a key place to interact with the East London tech startup community. Campus says 78% of survey respondents have been working at Campus for less than 6 months. Campus membership has grown almost 300% since January 2013 (8,000 to 22,500). It says the ‘outlook’ of startups at Campus remains very positive with 84% reporting a “positive outlook”. Vidra has also become known as a key proponent of the scene and its wider activities, including organising the charity event TechBikers. He’s now added the head of Google for Entrepreneurs Europe to his job title. Critics of Campus – and there are some – say Campus has led to too many paper-thin ‘app’ startups being developed, rather than truly big, disruptive ones and that might well be the case. But that may be to misconstrue it’s role in the super-early, boot-strapping, seed stage startups it’s largely aimed at – the ones that, hopefully, mature and get bigger on their own two feet. Certainly the model has proved to be high profile marketing for Google, and the fact they are rolling them out to other centres, such as Tel Aviv, suggests they like what it’s doing for them. Disclosure (again): As stated above Mike Butcher is co-founder of TechHub, a resident company of Campus London.